All's fair in love and hockey. . .
As his team's enforcer on the ice, Sebastian Deveau is America's favorite fighting Frenchman. But he's just as likely to get into trouble off the ice--especially when it comes to women. Shayne Beckford is so over hockey. It ruined her parents' marriage. It spoiled her brother's dreams. And let's not even talk about her college boyfriend . . . So when Sebastian Deveau walks into her brother's gym, she has no idea who he is. All she knows is that he's one gorgeous man with the sexiest accent she's ever heard. And since she never has to see him again, she lets him give her the best (.......) of her life right on top of the gym's dryer. But Sebastian isn't going to let this one-night stand get away so easily. He fights for what he wants, even if it takes fighting a little dirty . . .
My review: Holy hot French hockey star! **4.5 Stars! 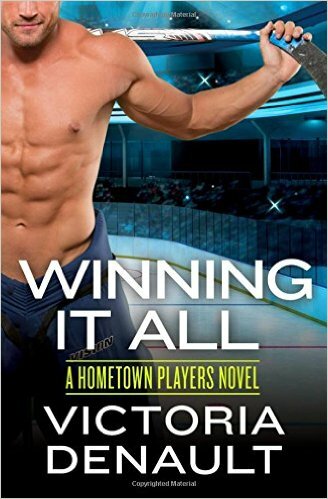 ** Hockey romances are fast becoming some of my favorites... and this was no exception. I absolutely adored Sebastian- there was not one single thing he did that didn't make me swoon. What an alpha hero he was! Poor Shayne was pretty determined not to get involved with a hockey player, and I loved that Sebastian was patient with her because her resistance to someone she had so much chemistry with got to be a bit annoying! It was hard to understand why it took her so long! I still thoroughly enjoyed and flew through this book. I loved Denault's writing style and plan on checking out the other books in the Hometown Players series- if they are as good as Winning It All, I know I will love them.